Bible Verses from the Book of Psalms to reassure us that God is with us in times of trouble and that we can be at peace knowing he watches over our life. After the verses from Psalms are 3 more bible verses on God's loving protection. 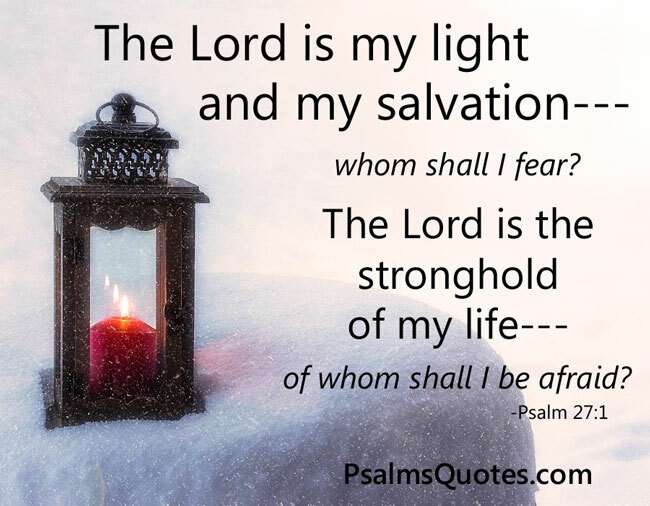 1 The Lord is my light and my salvation--- whom shall I fear? 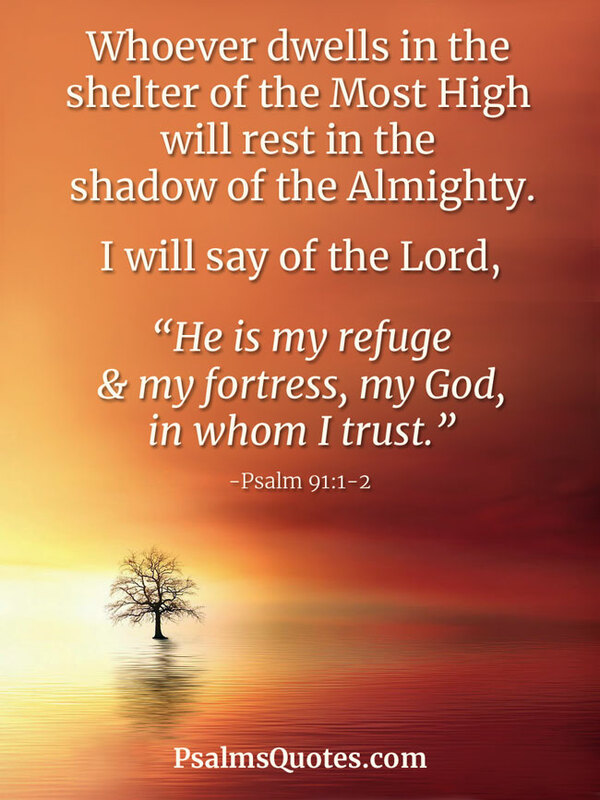 The Lord is the stronghold of my life--- of whom shall I be afraid? 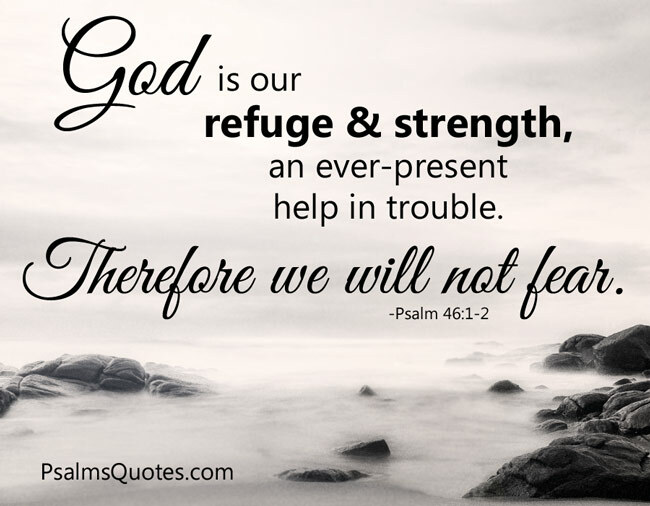 1 God is our refuge and strength, an ever-present help in trouble. 2 Therefore we will not fear. 20 Guard my life and rescue me; do not let me be put to shame, for I take refuge in you. 21 May integrity and uprightness protect me, because my hope, Lord, is in you. 1 I love the Lord, for he heard my voice; he heard my cry for mercy. 2 Because he turned his ear to me, I will call on him as long as I live. 3 The cords of death entangled me, the anguish of the grave came over me; I was overcome by distress and sorrow. 4 Then I called on the name of the Lord: “Lord, save me!” 5 The Lord is gracious and righteous; our God is full of compassion. 6 The Lord protects the unwary; when I was brought low, he saved me. 7 Return to your rest, my soul, for the Lord has been good to you. 8 For you, Lord, have delivered me from death, my eyes from tears, my feet from stumbling, 9 that I may walk before the Lord in the land of the living. 1 In you, Lord, I have taken refuge; let me never be put to shame; deliver me in your righteousness. 2 Turn your ear to me, come quickly to my rescue; be my rock of refuge, a strong fortress to save me. 3 Since you are my rock and my fortress, for the sake of your name lead and guide me. 4 Keep me free from the trap that is set for me, for you are my refuge. 5 Into your hands I commit my spirit; deliver me, Lord, my faithful God. 16 As for me, I call to God, and the Lord saves me. 17 Evening, morning and noon I cry out in distress, and he hears my voice. 6 Praise be to the Lord, for he has heard my cry for mercy. 7 The Lord is my strength and my shield; my heart trusts in him, and he helps me. My heart leaps for joy, and with my song I praise him. 8 The Lord is the strength of his people, a fortress of salvation for his anointed one. 9 Save your people and bless your inheritance; be their shepherd and carry them forever. 1 I love you, Lord, my strength. 2 The Lord is my rock, my fortress and my deliverer; my God is my rock, in whom I take refuge, my shield and the horn of my salvation, my stronghold. 3 I called to the Lord, who is worthy of praise, and I have been saved from my enemies. 16 He reached down from on high and took hold of me; he drew me out of deep waters. 17 He rescued me from my powerful enemy, from my foes, who were too strong for me. 18 They confronted me in the day of my disaster, but the Lord was my support. 19 He brought me out into a spacious place; he rescued me because he delighted in me. 3 When I called, you answered me; you greatly emboldened me. 7 Though I walk in the midst of trouble, you preserve my life. You stretch out your hand against the anger of my foes; with your right hand you save me. 1 The Lord is my shepherd, I lack nothing. 2 He makes me lie down in green pastures, he leads me beside quiet waters, 3 he refreshes my soul. He guides me along the right paths for his name’s sake. 4 Even though I walk through the darkest valley, I will fear no evil, for you are with me.